A few weeks ago I received a calendar in the mail from Pillsbury. I have no idea why I got it; but it was a pleasant surprise. It is the perfect calendar to hang in my kitchen because it is large and each month has a recipe and and a picture of that recipe’s final product. I thought what a neat calendar but really it was a calendar and cookbook all in one! 12 recipes 12 pictures, and a nice well put together calendar. I was excited and flipped through it, before I ran to the kitchen to hang it up. Most of the recipes featured in this calendar are from past winners of the famous Pillsbury Bake-Off. The other few recipes that are not from the bake-off are classic Pillsbury recipes using their products (like Monkey Bread). If I had thought about all this back before Valentine’s day these little pies would have been perfect for a Valentine’s Day treat or party. But because Valentine’s is long over I guess you will have to find another excuse to make these. Notes: You could easily substitute pie crust instead of the biscuits to make them more dessert like than coffee cake like (I actually did this for about half of mine). 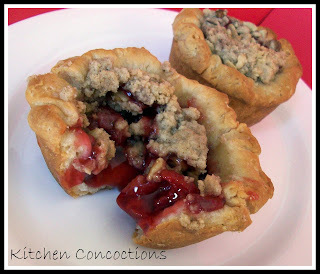 After making and eating them I defiantly realized that I should have added more pie filling and streusel topping to each one. ***Want a calendar of your own (so you can follow aglo)? Click here and sign up for The Pillsbury Newsletter and get your calendar for free! Hum, maybe that is how I got mine; since I have been subscribed to The Pillsbury news letter for quite some time. Heat oven to 350°F. In medium bowl, mix flour, brown sugar and cinnamon. With pastry blender or fork, cut in butter until mixture looks like coarse crumbs. Stir in nuts. Bake 15 to 22 minutes or until golden brown. Cool 5 minutes. 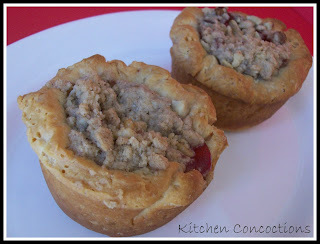 Remove from muffin cups; place on cooling rack. Cool 10 minutes.